This month ASEF culture360 contributor Herman Bashiron Mendolicchio focuses on community-based initiatives that are supporting cultural development in Malta. Stay tuned for 2 more interviews on this topic which will follow in the next few weeks: one with Sandro Debono on the new National-Community Museum in Malta, MUŻA and the second one with Caldon Mercieca on the Valletta Design Cluster project. The notion of community has been widely discussed and analysed at different moments and in several contexts and fields. Among the latter, we find: museum studies, with the significant goal of exploring the changing role of audience as well as the role of public institutions and their public dimension; social art practices, with the main focus placed on the development of new methodologies aimed at triggering participation, collaboration and engagement with the community; the philosophical sphere and the political and social field, where the concept of ‘community’ has been questioned, examined and dissected from multiple perspectives and in different directions (e.g. in the essays of Bataille; Habermas; Nancy; Agamben; Blanchot; to name just a few). There are certainly numerous and diverse approaches to and meanings of this key concept and it is important to stress that its research, exploration and examination has once again become urgent. What are the elements that can define the notion of ‘community’ in the fluid times of globalisation? How are places, spaces and contexts affected by the influence, role and contribution of ‘community’? What are – or should be – the interactions and connections between cultural development and ‘community’? What are the meeting points – as well as the borders, limits or friction zones between spatial policies, creative experiences and the needs of the ‘community’? In the specific context of contemporary cultural development in Malta, these questions related to ‘community’ – and its potential and desirable engagement – are taking a central position. The goals and priorities of cultural policies; the creation and vision of new cultural infrastructures; the need for developing new ways of social interaction; the urban planning; the organisation of cultural activities in local contexts and the examination and identification of places and spaces – with their stories, traditions and characters – are all taking into account the fundamental role and contribution of the community. The “Community Exchange” area promoted by the Arts Council Malta. “The community-oriented project is a national museum, the first of its kind, which shares a common vision with the Foundation’s objectives in promoting art and museums as a tool for social transformation. It shall promote greater participation by the community through a story-based narrative of display and related objects and empower a broader range of access tools to experience heritage and culture”. The MUŻA project is taking a substantial turn, re-defining itself from a ‘national’ to a ‘national-community’ art museum. MUŻA claims to rethink the whole significance of museum as well as the role of cultural institutions, curators and experts, heading towards an important shift where the major owner and player of the museum is the community. As stressed by Debono, “we seek to relocate art and creativity from a priceless commodity to a resource of relevance to the community”. Though MUŻA will open in 2018, the community-oriented process has already begun. 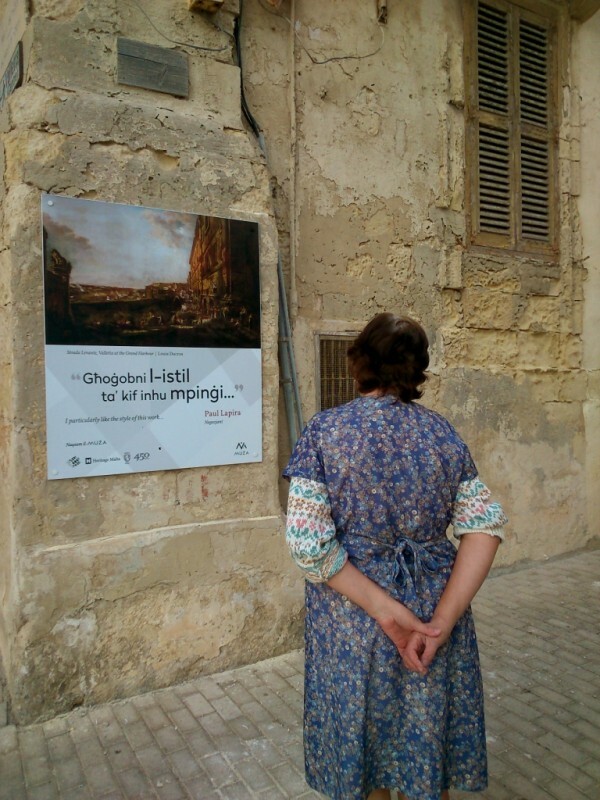 A prime example is the project Naqsam il-MUŻA (sharing the MUŻA), in which people from the Valletta community have been invited to choose artworks from the collection and propose a location for their future installation, while sharing their visions, stories and narratives. New interactive practices are constantly taking shape and challenging the structure and role of present-day cultural institutions. As Peter Weibel already indicated: “The museum of the future lives from the recognition that it is a public instrument of communication. Therefore, in the future, critical co-operation between museum operators and their visitors will be necessary, in order to bring about the past, present and future in the first place. Visitors must be freed from their passive role as consumers and encouraged to become active and interactive agents. The museum becomes a stage for the visitor – a place of options for activity and interactivity. In return, the museum elevates itself from a place of and for art to the level of art itself”. The Valletta Design Cluster shall provide a model of urban regeneration focused on creative networking, community integration and social regeneration. Efforts are also being made for the Cluster to interact and respond to the needs of the tightly-knit residential community surrounding the project site. Workshops and meetings with residents are taking place, and outcome from these workshops and encounters are influencing the decisions on site design, the future Cluster’s programming, and the spaces that can be opened for community interaction. The value and significance of this interaction resides not only in the final phases or in the project's “wish list”, but also – and this particular element is worth emphasizing – in the initial phases where the community is involved in envisioning the design and programmes of the new space. A wider spectrum of quality work that inspires community cultural exchange and reaches a broader range of people – engaging them as both audience and participants. Artists and arts organizations that promote cultural diversity and address cultural inclusion and accessibility. Beyond the institutional framework – and beyond the attractive project descriptions – it is important to provide a different context and a variety of platforms from where public culture can be considered as an accessible and shared common good. Malta now has the opportunity to write a new page in terms of contemporary cultural development, taking into account both the potential of cultural institutions, as facilitators of dialogue and exchange, and the essential contributions of different communities. Culture and community are living bodies and fluid notions that need to be constantly discussed and redefined. The main challenge is therefore to create inspiring and constructive spaces as well as moments and contexts where they can interrelate, connect and interact.